SIOA “No Mosque at Ground Zero” June 6 Rally (videos and pictures) | the "silent" majority no more! June 15: ALL 22 VIDEOS OF SPEAKERS ARE NOW POSTED . (June 21) Have added some photos as well. Please scroll down for more pictures and videos…. 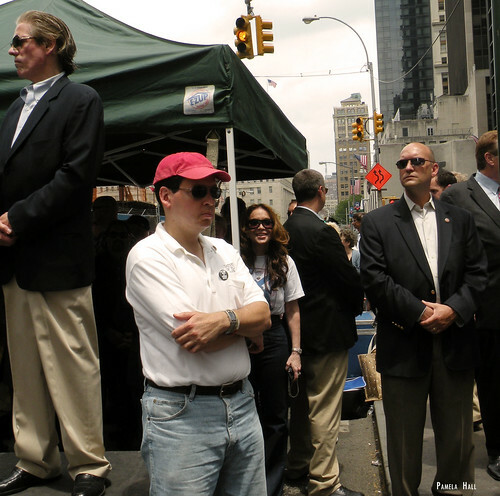 The D-Day at Ground Zero Rally sponsored by SIOA (Stop Islamization of America) was a success! We honored those who died on the beaches of Normandy and those who were murdered on 9-11 . Larry Savinkin , President of September 11 Family Group, uniting 9/11 families from the Russian-American Community. Beverly Perlson of The Band of Mothers mentions that 440 of our troops have died since 2009, with no mention of their sacrifice in the media. Also , someone needs to call-out the Muslim mothers to denounce this murderous behavior against our sons and daughters. Robert Spencer introduces Alan T. DeVona a WTC Patrol Sgt. who was on duty during the terror attack and Officer Michael Symonds. Jay Townsend , Candidate for US Senate against Chuck Schumer. Two Coptic Christian human rights activists, Nabil Asaad and Dr. Esmat Zaklama, talk about the horrors of living in a country ruled by Sharia Law. FINAL VIDEO Pamela Geller and Robert Spencer (co-founders of SIOA) wrap up the Rally and on September 10, 2010 they will return! Be there! The planned Mega- Mosque that would offer swimming pools and pretty meeting rooms where people can gather and read and ‘ask questions’ would become Dawah Central ” at Ground Zero. It must be stopped! Great pictures at The Peoples Cube and Looking at the Left and Urban Infidel .More posts are adding to the pictures of the THOUSANDS (don’t let “them” downgrade it into hundreds). Pictures at Eye On The World. And of course, Atlas Shrugs and Jihad Watch! This entry was posted in “NO!” to appeasement., current events, Fight for what is Right!, Look what happened America..., WE can fix if we try!. Bookmark the permalink. his argument is about religion and the expression thereof. Mayor Bloomberg stated that there would be no problem with protests if a Christian church or Synagog were proposed on the site. Mayor Bloomberg wake up! The reason no one would protest churches and or synagogs, with the exception of the ACLU, and that being on the grounds of separation of church and state. Again Mayor Bloomberg with the exception of the ACLU, no one would protest a church or synagog is for the reason that they do not blow up buildings with people in them to make way for new construction. Wake up Mayor Bloomberg and see if you still have a heart for the people of New York the people that elected you. The people whose relatives were also killed by those that now want to build a mosque at ground zero. Stand by others that are also against building this mosque, visit and sign petition . . . It took a lot of courage for this man to speak what he had to say for the world to hear. The retribution could be phenomenal, but at least he was willing to take a stand on his and Australia’s beliefs. Yes, allow those that want to come, to come. But understand that if you want to go to a country not of your birth, you should expect to live by their rules and respect their ways of life. This doesn’t mean you have to give up yours. I think he explains it very well. Pingback: Photo Essay compares 25th Annual Muslim Day Parade with previous years & a look ahead… | the “silent” majority no more!